HOLDING his baby girl for the first time since she was born was the perfect homecoming present for first-time dad Jenson Button. 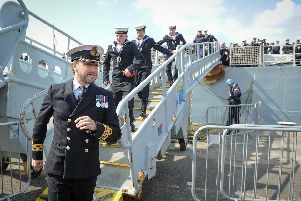 The 18-year-old Able Seaman from Gosport was among the 240-strong crew of HMS Dragon to return to Portsmouth yesterday. The proud young sailor last saw her his little girl, Elsie-Rose, when she was born on March 10, having flown back home especially to be there for her birth. ‘This is overwhelming,’ said the teenager as he cuddled the one-month-old baby, who was dressed up as a sailor. ‘The feeling of it is just something you can’t describe. AB Button was welcomed by his partner Jordan Lindsey, 19, who was thrilled to have him back him. AB Button said he was hugely thankful of the navy for allowing him to fly home to be with his baby girl when she was born. More than 1,000 people turned up to welcome the sailors from Dragon back to shore. Among them was Michelle Brett, of Horndean, who was waiting for her husband Chief Petty Officer Stuart Brett, 54. The 51-year-old said: ‘We have been together for years so you get used to them being away as a navy wife.